Advance tickets are now on sale from Hackney Picture House (CLICK HERE). Please note, there are two seated film showings during the course of the event, so you need to select the time you want to see the film. The event runs from 8pm – 3am. Justin Robertson (Deadstock 33s) Acid House Set, Fred Deakin (Lemon Jelly), New AV show, Ashley Beedle (Heavy Disco/ Darkstarr) Psychedelic funk set,Ben Osborne (Noise of Art) Cosmic Disco set, Fiona Bevan, Leftside Wobble (K7) Acid Soul set, Si Begg (Noodles) New AV show, Rupert the Brewer, Overlap, The People Pile, Your Mum, Laura J Martin and more to be announced. 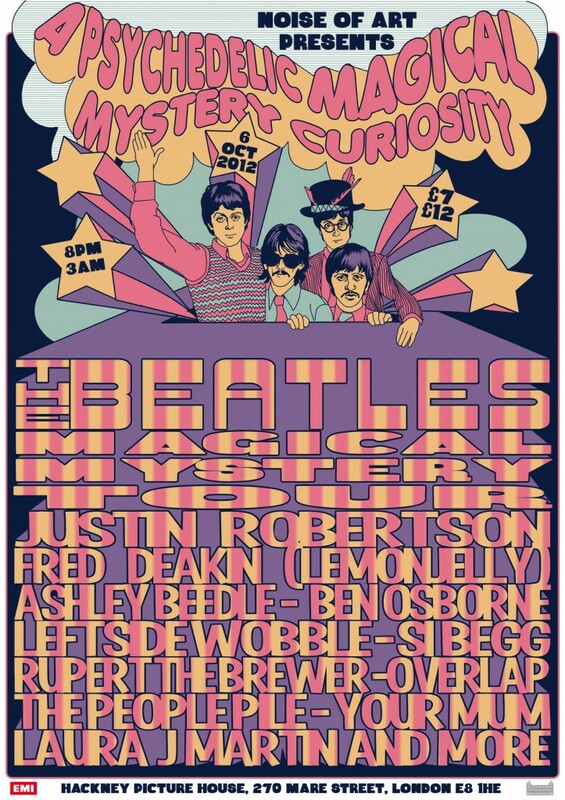 Noise of Art presents a night of film, music, art, DJs and psychedelic curiosity over three floors and featuring The Beatles film MAGICAL MYSTERY TOUR, now fully restored with a remixed soundtrack – finally shown on the big screen for the first time, 45 years after it was made. First broadcast by the BBC in 1967, The Beatles’ Magical Mystery Tour’ was a product of its era while also being years ahead of its time. The film anticipated techniques that were to become industry standards , such as ad lib film scripts, mocumentaries and surreal Television comedy. The night is inspired by the evolution of psychedelic music, from folk, through rock and soul music, to acid house and contemporary club music. With more acts being announced, the line up sees Justin Robertson, creator of the ‘Art of Acid’ compilation, play an acid house set, electronic music pioneers Si Begg and Fred Deakin play new audio visual sets, Ashley Beedle, spin a psychedelic funk set, and Leftside Wobble and, Noise of Art founder, Ben Osborne, mix cosmic dancefloor fillers. Fiona Bevan and Laura J Martin, two of the UKs fast rising female singer songwriters, will form part of the folk connection. They join Noise of Art regulars, The People Pile, Overlap, Your Mum, Prick Image and more to be announced, who’ll complete the immersive cinema and club experience. Rounding off a week of events that’s seen the Beatles’ cult film, Magical Mystery Tour, shown on the big screen for the very first time, Apple Films Ltd (the film making arm of the Beatles’ company) is allowing Noise of Art to screen the film as part of Noise of Art’s cross platform clubbing event. This is the last screening in a week of events celebrating Magical Mystery Tour in the run-up to its release on Blue Ray and DVD. It follows a gala event at the BFI Southbank on Oct 2nd, where Noise of Art will create the after show for an invited audience. The event continues Noise of Art’s celebration of the 45th anniversary of psychedelia, which started with a sell out New Year’s eve event in London and saw three days of activity at Latitude Festival.